The Canon DC10 is DVD camcoder with 1/4-inch CCD. It's equipped 1,330,000 pixels with 10x power zoom. It has 2.5 inch TFT Color LCD Screen and 0.33-inch TFT Color Viewfinder. The camcoder has physical dimensions of 47 x 86 x 122mm with weight 14.6 oz (not including lens and battery pack). Ok, more detail informtion about the Canon DC10 specifications and features you can read in the Canon DC10 Manual on page 141. Not only about specs, in the manual you can also get reference information about settings and troubleshooting. The Canon DC10 instruction manual contains of 147 pages.It's available in english, francais, and espanol. In the manual provide detail information such as about preparations guide like prepring the power supply, using the wireless controller, adjusting the LCD screen, changing the display language, setting the time zone, date and time, inserting a memory card and loading a disc. 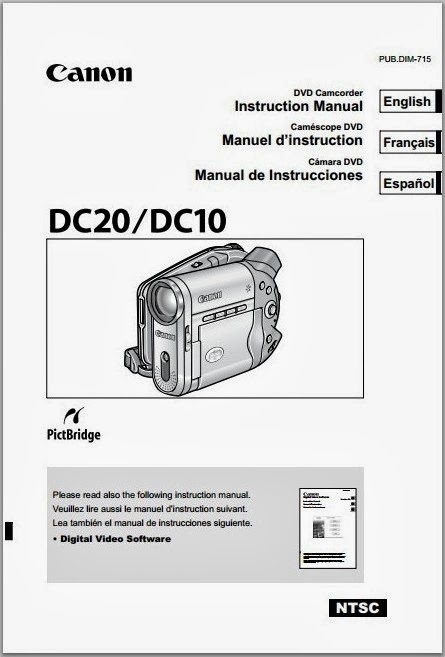 Then in the Canon DC10 user guide also discuss about recording movies, tips for better recording, playback, using the recording programs, changing the FUNC. settings, using the digitl effects, changing settings with the MENU button, creating a playlist, dividing a scene, protecting the disc guide, recording to VCR, printing guide, maintenance, problem solvings and more. If you have a problem with your camcoder, you can read in the troubleshooting section of this manual on page 123. You can also consult to Canon Service center if the problem persists.